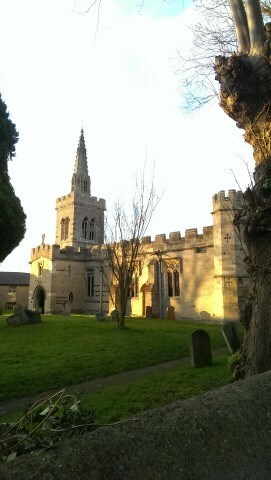 The parish church of St Lawrence was built in the mid-14th century. It was built for John Curteys who, with his wife, is buried in the chancel and work started in 1350. Apparently the masons responsible came from Northamptonshire but were given a somewhat tighter budget for this church and were assisted by some local workmen. The tower and spire are lavishly ornamented. The interior is rich and complex, with a fine nave roof and the remains of a portrayal of the Doom. The county's best example of the luxuriant spirit of the 14th century.